Matthew Kelly and John Wark in Toast. Photo by Oliver King. BOTTOM LINE: There is a great performance happening on the stage, but the play is full of loose ends that will leaving you wondering exactly what you’ve seen. Toast, by Richard Bean, is the story of seven men working late into the early morning at a bread factory in imminent danger of being shut down. They all know the end is coming, but all they can do is keep working to earn what little pay they receive, that is until something goes wrong in the industrial-size oven and production halts to a rare stop. This affectionate snapshot into the lives of these men left me very curious about their relationships, but also a bit baited by the story I was told. Toast takes place in two acts, each about an hour in length and completely continuous. The working clock onstage assured me that everything I was being shown was happening in real time. This leads to several moments throughout the play where we see a character alone onstage, seemingly waiting for the next thing to occur. Bean is not shy about including nods to the playwrights whose work is referenced in this play. Multiple mentions are made of waiting for their boss, Beckett, to call or show up, but we neither hear nor see Beckett at any point. 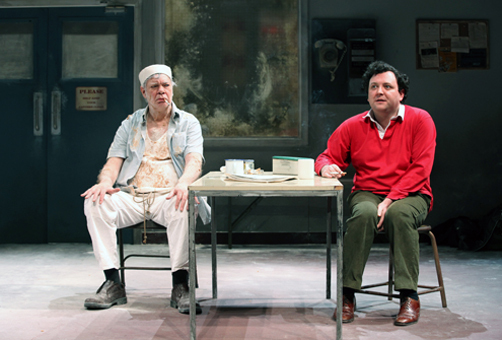 The absurd aspect of the play is most vocally articulated through Lance (John Wark), a man who shows up for his first shift at the plant and reveals his somewhat unclear ulterior motives to the other workers one at a time. Although we are never made fully aware of Lance’s intentions, his entry to this community, and the freedom and whimsy that visibly accompany him, create a clear contrast to the more rough and sour environment of the factory workers. This dynamic was interesting because the world of play so adamantly rejected Lance’s attempts to disrupt it. A lot happens offstage in Toast. All of the action takes place in the break room, while we hear from the men about the work happening inside the plant and the opportunities that await them if they ever get out (mostly clandestine meetings with their wives). Even the event that turns the plot is only relayed to us by characters running in and out reporting on events from upstairs. The playwright’s dedication to preserving the vernacular of the period often made it somewhat difficult to parse out information as a younger non-British viewer. Chunks of conversation were unfortunately lost on me because I was focusing on understanding words and phrases (not to mention a few jokes) that went over my head. Great performances from the whole cast thankfully make the intentions of the characters clear and specific so I could find my way back from these moments where ideas got lost in translation. However, many of the clearest moments of the story, when I looked at it as a whole, are missing a feeling of resolution. A lot of threads start to be woven, but those endeavors all collapse under the gravity of the turning moment and the danger the new circumstances hold for the men. Toast baits us with an incredibly deep, crafted world that left me wanting to know more about what I had seen. I felt like I had been shown only a fraction of the real meat existing between these characters underneath the surface, and it was a bit disappointing to feel that only a few stories came to a satisfying conclusion. It is great to see a skilled cast and creative team tackle a complex text with a lot of inherent challenges; however, it also might be somewhat challenging for the casual theatregoer to appreciate the inner-workings of the play because the surface level action can be alienating. Toast is written by Richard Bean and directed by Eleanor Rhode. It is produced by Snapdragon Productions in association with Jagged Fence Theatre. Set design is by James Turner. Lighting design is by Mike Robertson. Costume design is by Holly Rose Henshaw. Sound design and compositions by Max Pappenheim. The cast is Will Barton, Simon Greenall, Matthew Kelly, Kieran Knowles, Steve Nicolson, Matt Sutton, and John Wark.